Immortals and non-Immortals both Enjoy Life Equally, so says Baccano! It bothers me to say I took a while to realize the quality of "Baccano!". Aside from boasting no less than 18 main characters, the Pulp Fiction-esque narrative would constantly fracture and leap back and forth in time. I didn’t like that I had to make an effort to constantly focus and be forced to remember so many names and faces; three episodes in, I was feeling frustrated and close to losing interest. Something needed to be done and in a last ditch attempt to salvage the series, it became clear I’d have to wait it out, build up the fansubs and spend a long weekend working my way through each episode; allowing time to fully immerse myself in the story. And now that weekend is past; the end result is? What the hell did you expect? Awesome! Many desire immortality, yet the key to eternal life has forever eluded man. The story of "Baccano! " begins in 1711 when a group of sea-faring alchemists capture this most desired of gifts. Nearly all of them become immortal there and then, yet, as fate would have it; only one is granted the knowledge to recreate the potion. Of course, he quickly decides not to tell, wisely realising the folly in allowing such power to leak out into the public domain, but his brave decision quickly incites murder and ultimately, a struggle that’s raged for over 200 years. We join the story as it reaches its climax during prohibition-era North America; this was the absolute height of organised crime in the US, a violent and cruel time to live, or indeed, die. Despite its frequent lapses into light comedy, squeamish readers should be warned that this is a deceptively violent (and often, sadistic) series. Without going into too much detail, lets just say that bones break, arms get sliced, faces explode and children are tortured. Of course, this refreshing lack of moral compunction inevitably climaxes in some breath-taking and unpredictable action scenes, including several sequences of beautifully animated hand-to-hand combat, fought on the windy carriage-roofs of a moving train. Just so you know, it turns out that knives, guns, grenades and even flame-throwers aren’t much of a match for blood-thirsty gymnasts. "Baccano! " is a lot like "Black Lagoon"; it has that same delirious hunger for gruesome carnage. On its own, the action wouldn’t be enough, but as I’ve already mentioned, this is hardly a conventional series. Aside from the fact that the narrative will regularly interchange years and events in a matter of seconds, many of the characters provoke empathy and romance despite having splattered the brains of an adversary all over the wall minutes earlier. I loved the playful dialogue, and the character interactions are remarkably fun and natural; you believe in their fear, sadness or anger. You can see a love affair unfolding and it’s almost heart-breaking. By the end I was completely riveted by the story, lost in the characters. There is so much to say about "Baccano! " but I’m afraid I’ll lose your concentration if I keep going. I’ve already had to completely scrap the first version of this review since it degenerated into a bloated rant. Obviously, I absolutely loved this series, and if I ever get around to writing a review of 2007, it will easily make my top 3 of the year. The best decision I made was to push through it over a quiet weekend; as expected, the jumbled jigsaw of a plot and all those unique characters are so much easier to remember this way. The only problem is that now I’m having trouble letting go, I’m still stuck in the world of immortals and trying to fathom out the few remaining mysteries. Hints are made at characters and storylines beyond the anime narrative and quite frankly, I’d die for a sequel. 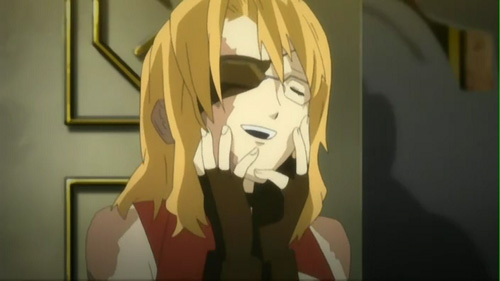 If you’re yet to watch "Baccano! "; I envy you. 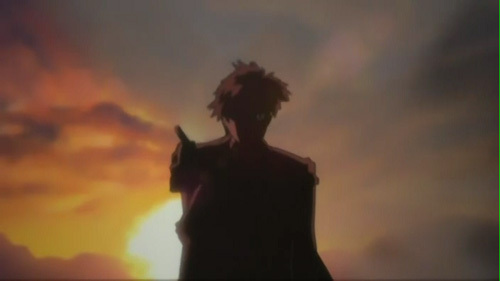 Pingback: World of Anime » Immortals and non-Immortals both Enjoy Life Equally, so says Baccano! hehe i knew you would love it!! now just check out romeo and juliet! seriously… it was phenomenal. Oh yes Baccano is such a fun show. It had a lot of competition for 2007 so I won’t say it’s my favorite show of the year but it is definitely in my top 5 for 2007. I also hope there will be a sequel. Well the novels are still going so I think there is plenty of material. There is hope for a sequel — Baccano! is based off of a series of light novels which, like the anime, jump about in time (there are a few in 2001, one or two in the 60’s but the bulk of them are in the 30’s if i recall correctly) so a sequel is entirely possible. I agree though. Baccano! was easily one of the best series i’ve watched this year; that and Dennou Coil. I do think the biggest difference in our taste is that your able to put up with certain GONZO anime and I’m unable to get past their opening episodes. You’ve always rated Chrono Crusade and Witchblade and now, R+J too, but other than Gankutsuou and Last Exile, I’ve never completely adored GONZO anime, something about their productions is way too generic for my liking. What is your favourite anime of the year? For me, it’s a three horse race between Baccano!, Gurren Lagann and Toward the Terra… I’m tempted to include Dennou Coil in that list too, but I’m still waiting for the last few episodes to be fansubbed. Also, I know what you mean about the characters. I couldn’t name any names in this review precisely because I’d end up on a massive rant. My favourite couple was Ennis and Firo, and as far as odd-balls go, the Rail Tracer was very interesting by the end – especially when he found the message carved by Chane. Just make sure you blog it too, I’d like to know what you make of it. Thanks for the info. Protodude said on my MAL profile that there will be 4 OVA episodes released with the DVD volumes, so it should be interesting to see whether or not they have anything new to offer the story. Ahh!! How did I miss this post!? I’ve been waiting for ages to hear your opinion on this show! Ah!! For me, Baccano! was one hell of an experience, totally breath-taking. It was so complicated, but everything worked, every last piece of the plot, every last character, every last detail coming together, building up to that last monstrosity of a climax. Baccano! was beautiful, I had absolutely no idea what I was getting myself into when I started that first episode. It was just so crazy, so indulgent in every aspect, from the characters, to the action, the gore, even the romances, just indulgent fun. Definitely one of my favorite shows this year, right up there with Gurren Lagann. I agree with pretty much everything you had to say about the series. Only I didn’t have any trouble keeping up with it from week to week. I do understand the need to marathon it though. I rewatched it in marathon form and was in awe.The show was brilliant, and there’s rumors of a 3 OVA sequel in case you haven’t heard. I just finished watching Baccano, and was totally surprised at how entertaining and refreshing it turned out to be. I started this show just like you, barely holding enough interest in all of these ongoing, independent subplots that jump back and forth, with an endless list of characters. Any show that starts out like that is a hard sell in my book. But when they finally began to add some background to this fractured mess, it all started to congeal together in a way that made the 2nd half totally involving, without losing its signature spontaneity. The comedy was light-hearted and fun, once I finally warmed up a little to Isaac and Miriam’s two-punch combo. The fights were orchestrated very beautifully. I would love to see another season of this show, as now the stage is set for a lot of the interactions that can occur between the Immortals and whatnot. Thanks for the review; if not for it I probably would’ve dropped the show and never looked back. @Dan: Thanks for the comment, Dan. It’s nice to know I prevented you from dropping Baccano! into oblivion. Also, it’s worth noting that two or three OVA episodes seem to be coming out at the moment, so it’s not over just yet. Anyway, Baccano! has instantly and permanently become one of my personal favourites. The breathtaking narrative and action, both served in a Tarantino-esque fashion, took a hold of me at the very beginning and never let loose till the very end. Then there are the heroes. Even though there’s a myriad of ’em, I’ve grown attached to every single one. Well, maybe besides the main villain, but that’s kind of obvious. My favourites are Isaac and Miria. I simply loved how wonderfully oblivious they were to, well… everything. I hope there’s going to be a second season. Right now I’ll have to settle for the OVAs.